Increase your storage space without sacrificing your distinct sense of style thanks to the Dillon 40-inch Shelving Unit. The frame consists of stainless steel for supreme quality and holds five non-adjustable shelves that make it simple to display books, photographs and more. The shelves consist of American walnut veneer for long-lasting quality. In addition, the shelves offer ample space, ensuring you'll have no trouble displaying books, photographs and much more. 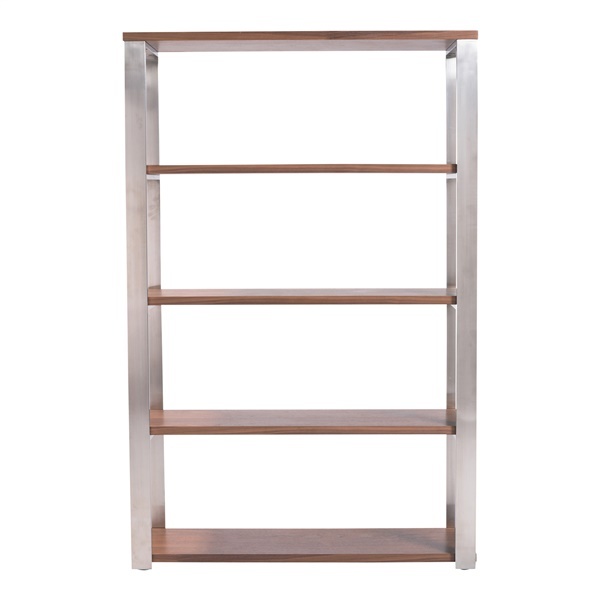 An ideal choice in a modern or retro setting, the Dillon 40-inch Shelving Unit is sure to serve you well. Consist of American walnut veneer that is both stylish and practical. Offer ample space to display books, photographs and much more. Includes a deluxe stainless steel frame that provides strong, sturdy support. Features a sleek yet practical design, making it a great choice in a modern or traditional setting.